I fractured my right 5th metatarsal last March after attending my niece's graduation. 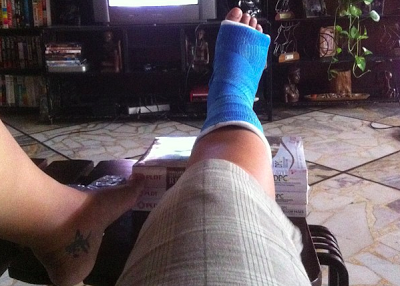 But I only got my foot placed in a cast after Holy week, since I sought a bone specialist for it. My blue, rough, half-calf cast was molded on me last April 1. 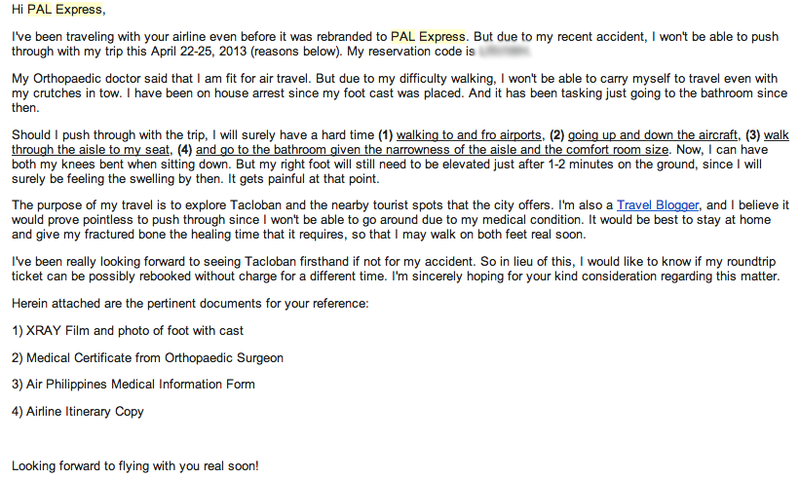 Given that, I asked my Orthopedic doctor if I could still travel to Tacloban. But he advised that I put it off for now. I was disheartened after I heard his advice, especially when I was already booked to leave on April 22. Then again, I had to divert my disappointment since my health was my first priority. 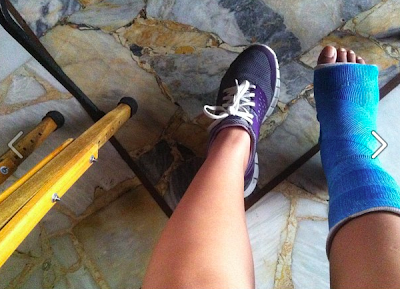 I didn't want to have to travel with a cast anyway, even if I brought my crutches with me. The next concern was rebooking my flight with PAL Express, since I could no longer make the trip. So after getting my diagnosis, I immediately contacted the airline. I was then advised to email my concerns. After that, a reply from the airline company was received a day after. I was advised to have my Physician fill up the Medical Forms that they've attached on the email. So I printed the forms and had those sent over to my doctor. And after securing my medical certificate and PAL Express Medical Forms, I emailed all of my scanned copies to them right away. On April 22, my request for 'rebooking without charge' was approved. Below are the details of what PAL Express sent me. I was relieved at some point despite being billed P1,300+ for the fare adjustment. I got Rubel to settle everything on my behalf at PAL's Cubao Ticketing office, while providing him 2 Valid ID's, my ticket and my Authorization Letter. Despite the extra charges incurred, I was still happy that I'll be able to finally push through with my trip to Tacloban. Hi Istin! Yung case ko kasi was subject for approval pa. So wala rin akong guarantee if maaapprove yung request ko for rebooking. Pwede din kasing magVary ang reasons nila. Since medical concern yung akin, they sent me their own Medical Forms. Mukhang naSatisfy naman sila sa findings ng physician ko so they approved my request. Although may fare adjustment lang sa ticket ko. I forgot to ask, how is your injury progressing? I hope you are fine now. Good thing that they rebooked your flight and get well soon. That is great that your request was approved without any fees. Hope your injury is fully healed now. oh, I saw your IG post, good to see and know that you are better now! good to know as well that PAL was considerate. Have fun in TAcloban! I'm glad to know that you're better now and probably raring to go and take that postponed Tacloban trip. Take care! at least they had a way to resolve the issue though it still would cost you money.. too bad to hear about the injury.. This is why I love PAL! I hope you are better now. BTW, I forwarded to my niece your recommendations and they have booked their honeymoon...I just don't know ehere since she has not given me her itinerary :) Thanks Mai! I think rebooking with PAL is so much easier than Cebupac. My hubby always fly with PAL also and they are very accommodating and efficient. Hope you're feeling better now.